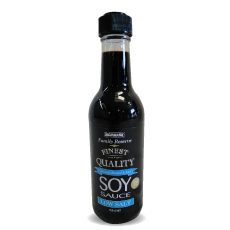 Our Low Salt soy sauce is naturally brewed from premium soy beans and aged for 6 months. It has a reduced salt level whilst still maintaining full soy sauce flavour. It can be used as an ideal replacement for salt in dishes and enhances the flavour in foods without overpowering it. Works perfectly with sushi and sashimi dishes. Our Low Salt Soy Sauce does not contain any MSG or Colours and is Non GM.